So, in Sofia we are nearing our journey’s end – at least in the sense of achieving the goal of Istanbul. Trains become really quite complicated the further east you go; there are few options and those that are available are slow and dismal as a rule. Work on bits of the line meant that the leg from Sofia to Istanbul would involve 3 changes in the middle of the night, would take longer than the alternative of the bus, and because of all the changes there would be no couchette (possibly, that’s a bonus given previous couchetting!). So on Friday morning we did take the train, the 10.30 but only as far as Plovdiv (pronounced in a deep voice and with a very loose and liquid lower jaw as if imitating a Russian, a little spray is also helpful here) where we would spend the day before catching the overnight bus. What a treat! Plovdiv is a lovely city and the old, indeed very old town is beautiful, interesting and delightfully calm. Plovdiv is also very colourful and we realised that this was something we missed in Belgrade and Sofia, which seemed so monochrome, not helped, of course, by the grey weather. So we had a good day in Plovdiv wandering the cobbled streets, peeking into some of the ornate old Orthodox churches as well as browsing in an artisan centre that’s been restored with UNESCO funding and where traditional weaving, embroidery and ceramic crafts are practised – yum! 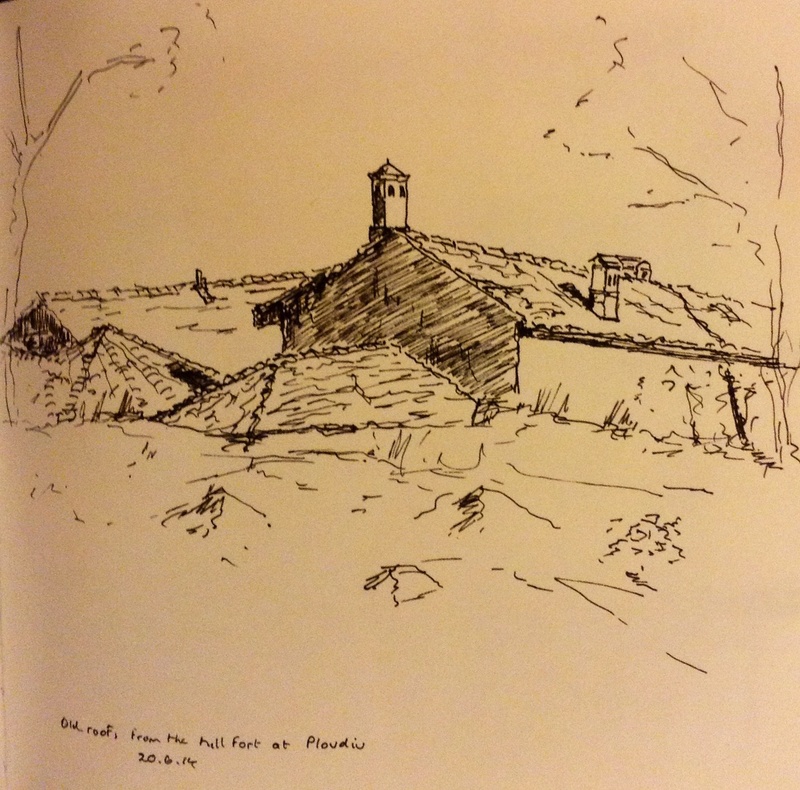 Jim did a sketch of the craft workshop from the ruined fort further up the hill (I’ll try and attach it to this post). The bus to Istanbul left Plovdiv at 10.30 pm and the service knocks spots off the train. Clean, comfortable, excellent reclining seats with on board entertainment and a blonde conductress (she’s not the entertainment and, on reflection, it doesn’t matter about the blonde; a brunette or a bloke could have done a great job too) who served us coffee, cake and a little cleaning wipe as we set off down the road. The only problem with the journey is the crossing of the borders. You’re just settling down after drinking the coffee and wiping the residual crumbs off your hands having finally released the wipe from its plastic wrapper; you’ve finally found a reasonable sleeping position and the irritating bloke who can’t sit still finally does; it’s about midnight; the lights have been turned off and everyone is quiet; you nod off. Then bang and flash, on come the lights again at 1 am as we arrive at the Bulgarian border. Everyone off the bus for passport inspections. Board the bus again for about 5 minutes and then it pulls into an enormous duty-free centre, absolutely huge hangar of a place. 10 minutes allocated but people straggle back after about 15. Back on board for the few hundred yards to the Turkish border control where join a queue of buses, some of which are having their luggage trunks emptied and bags are being checked one by one. Our turn and we’re off the bus again, passports are whipped away by the Turkish border guard – gave us quite a turn until the blonde conductress delivered them back safely into our anxious hands. By this time it’s well after 2 am and one feels all woken up again. A few little noddings off then waking up in an awkward position with a stiff neck. And before you can really get into a good sleep, the bus arrives in Istanbul, a whole hour early, at 5 am. It was a bad night and it sounds more banal, but the night bus to Istanbul was much better than the night train to Sofia. So we’ve left Europe. More about that and the longest day of the year in the next blog post.